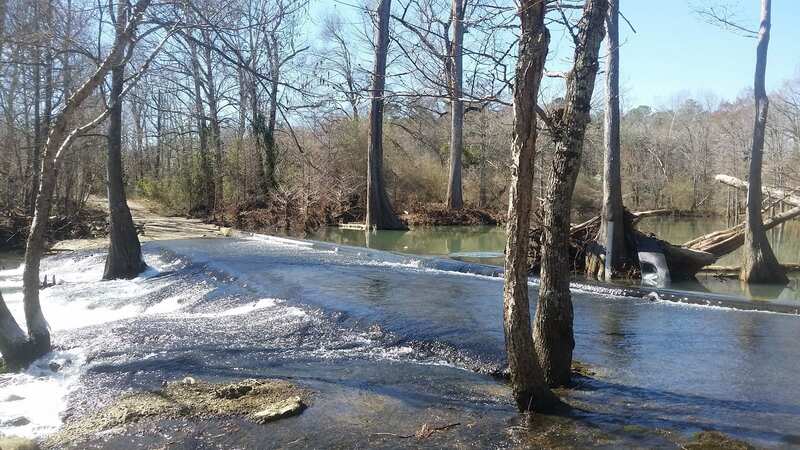 Darrell Bowman, Assistant Chief of the Fisheries Division at the Arkansas Game and Fish Commission (AGFC), is working towards improving the integrity of streams throughout the state by removing outdated low-head dams and slab crossings. There are over 9,000 dams and road-related barriers altering the flow of streams throughout Arkansas, according to the Southeast Aquatic Barrier Tool (https://connectivity.sarpdata.com/summary). Much of this infrastructure was originally built to provide energy production, flood control, water supply, and recreation. While some of these structures still serve the intended purpose, many are now obsolete. Dams and slab crossings that no longer serve a purpose can be costly to maintain and often fall into a state of disrepair. These structures may be dangerous for the public because the circular flow conditions they create just downstream of the dam can lead to drownings. Also, during high flow events, reduced integrity of the dam could lead to failure of the structure and result in downstream flooding. These low-head dams and slabs can also be nuisances on floatable streams, reducing recreational value. Dams are also linked to several environmental problems, such as hindering the movement of aquatic organisms, altering flow conditions, and promoting sedimentation issues above the dam and erosion issues below. Removing these structures allows fish and other organisms to move freely up river and returns impounded waterbodies to free flowing streams. However, removal of these outdated structures is not without concern. During their life, low-head dams may store large quantities of sediment, nutrients, and other pollutants. Removal of the dam can free these materials, potentially influencing downstream habitats. There may also be socio-economic factors to be considered. For example, does the structure have historical significance worth preserving, or will the removal of the structure negatively affect individuals or local communities who have economic interests in the impounded waterbody? To help make these determinations the AGFC has partnered with 18 other government and non-government organizations to form the Arkansas Stream Heritage Partnership to develop strategies and protocols for removing obsolete barriers in Arkansas streams. “The primary objective of the Partnership is to restore streams to their natural, free-flowing state” Bowman said, adding that “the group does not advocate for the removal of all dams, just those that are no longer wanted or serving a functional purpose”.